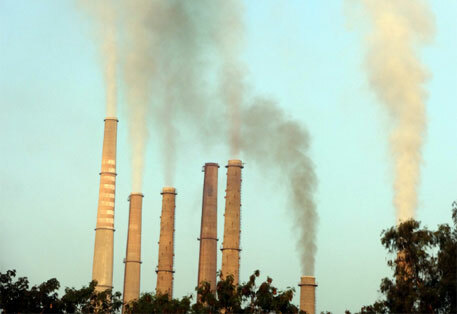 India's powersector, based predominantly on coal-fired plants, is one of the most polluting sectors of Indian industry. 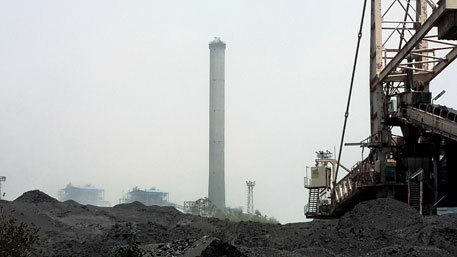 To highlight key environmental issues and rate the performance of power plants, Centre for Science and Environment (CSE) intensively studied the sector for two years, covering 47 coal- and lignite-based thermal plants with a capacity of 54 gigawatts (GW), half of the Indian capacity when the study began in early 2012. CSE’s assessment found glaring inconsistencies between pollution data, especially stack emissions, reported by plants and actual conditions on the ground. Events like breach of ash dykes, which would be considered disasters in other countries, were taken in stride as common —a number of water bodies were found to be polluted with ash. No country in the world uses coal as poor in quality as India, so our pollution challenges are huge. But our practices to overcome this challenge were found wanting. 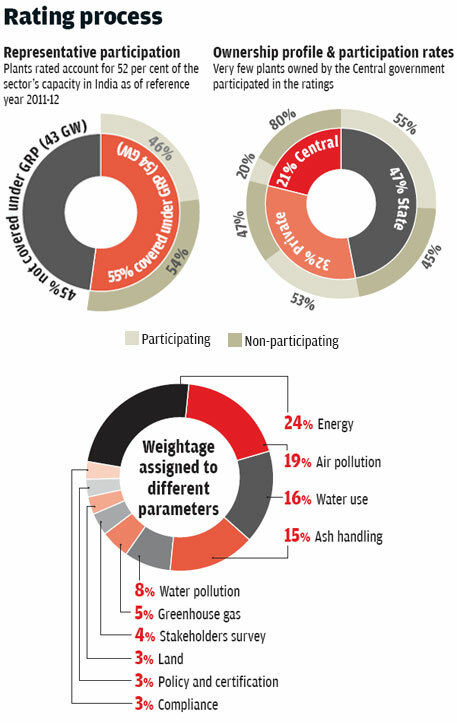 India’s standards for pollution and resource use lag far behind global norms, but its power plants fail to meet even such relaxed levels of performance, lacking the basic technologies to control pollution. With state pollution control boards understaffed to monitor performance, power plants routinely flout norms; nevertheless, the plants almost always report compliance. The situation is complicated by the fact that the power sector is a critical sector of the Indian economy. Thus, under the rationale of the need for power, even the most inefficient and polluting plants are allowed to operate. With one of the poorest levels of energy access and per capita consumption of electricity, at a third of the world average, India needs to rapidly expand its generation capacity. Coal is the fuel of choice. Being plentiful and easy to mine, it provides reliable and dispatchable power. Capacity of coal-fired plants is projected to double between 2012 and 2022 and will contribute nearly 75 per cent of generation. Current environmental practices will have to be improved to make this increase acceptable. Coal-based electricity entails heavy costs on the environment, resources and health. It is responsible for significant emissions of harmful particulate matter and oxides of nitrogen and sulphur. Domestic coal’s high ash content introduces additional challenges of disposing off ash that has toxic heavy metals. Coal-based power consumes large amounts of water; coal mining has severe impacts on land, air and water which exacerbate the environmental footprint of coal-based power. Instead of capturing the full costs of coal-based power, India’s tariff system subsidises it— land and water is provided at low costs and coal is subsidised; weak or non-existent pollution norms mean plants do not have to invest in pollution abatement technologies; finally, costs such as health impact and environmental damage, called externalities, are left out of the tariff calculations. These make electricity from coal “affordable”. Of a total of 104 coal- and lignite-based thermal power plants in India with a capacity of 98 GW in early 2012, the Green Rating Project (GRP) team of CSE assessed 47 plants with a capacity of 54 GW (see ‘Report card’). The sample was chosen to present a comprehensive picture of the sector, with wide representations from all regions, types of ownerships (Central, state and private), companies and unit sizes (see ‘Rating process’). The GRP team considered only the generation phase—from the entry of coal inside the plant boundary till the generation of electricity—to assess the plants. Although coal mining has significant environmental impacts, it was not considered because it requires independent assessment. Overall, 46 per cent of the selected plants agreed to participate in the ratings, which means they submitted detailed data and allowed the GRP team to visit the plant and audit its performance (see ‘Shy of public scrutiny’). GRP surveyors visited all of the 47 plants, spending several days at each, and conducted extensive interviews of all stakeholders, including community, media, NGOs, pollution control board officials and plant employees. They also collected extensive data from secondary, publicly-available sources for both participating and non-participating plants to prepare profiles of individual plants. Participation BY the coal-based thermal power sector in the Green Rating Project (GRP) was low, partly because a number of plants run by Central government-owned companies refused to participate. 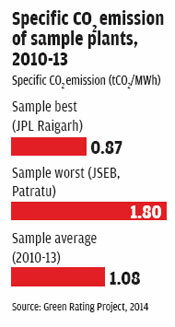 NTPC, the leading player, was the chief culprit with none of its six plants in the sample agreeing to provide data. The generation-related information was sought under the RTI Act from the six NTPC plants, but all declined the request citing confidentiality and competition-sensitive data. The Central Electricity Authority, the government regulator, asks all power plants to submit key generation-related data. NTPC has refused to allow even the regulator to publish efficiency data related to it. GRP did gather information from the regulatory bodies and local community and media. It found the NTPC plants to be heavily polluting and facing numerous complaints. All companies that were selected, were rated irrespective of their participation to make sure the exercise was objective and unbiased. Companies were analysed with reference to global best practices and Indian averages. A technical advisory panel consisting of top industry and pollution experts oversaw the entire process to ensure credibility. They include B Sengupta, former member secretary, Central Pollution Control Board; Avinash Chandra, former professor and head of Centre for Energy Studies, Indian Institute of Technology, New Delhi; Umesh S Bapat, former vice president of Operations Eastern Region, Tata Power; and Y P Abbi, former director of Power Station Engineering, Bharat Heavy Electricals Ltd.
GRP rated the sector on about 60 key parameters which were assigned weightages depending on their environmental impacts (see ‘Weightage assigned...’). 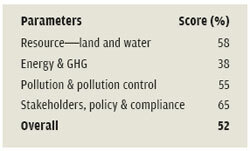 Resource use and pollution were assigned equally high weightages. Coal-based thermal power plants in India are heavy utilisers of resources. Land, water and most importantly, coal are used in large quantities. Most communities located near the plants do not benefit significantly from these plants although they share their resources with them. Land: Situated on the southern fringe of Delhi, NTPC’s 705 MW Badarpur power station is luxuriously spread over 874 hectares (ha). Of this, 362 ha has been used to dispose of its waste. A few kilometres away, Sangam Vihar’s 1 million residents are packed into about 680 ha. The Central Electricity Authority (CEA) suggests using 0.44 ha per MW of capacity. CSE data found that the plants possessed far more, using an average of 0.72 hectares/MW, of which over 40 per cent was used for disposing ash; old state-owned plants used nearly four times more area per MW than private plants. If land used for coal mining, water reservoirs and ash ponds is added to this, a 1,000 MW plant would use about 8,800 ha over its life, a figure that dwarfs land use for all technologies except hydropower. GRP study found widespread mistrust in local communities related to acquisition of land for power plants. Most said that adequate compensation was not paid and jobs and benefits did not materialise. These past experiences are impeding land acquisition for upcoming projects. Coal: India consumed about 700 million tonnes of coal in 2012-13, of which 70 per cent was used for power generation. The insatiable demand by the power sector has been the major driver of coal mining, an activity responsible for significant environment damage. A number of districts where Coal India Ltd (CIL) has extensive mining operations have been classified as critically polluted by the Central Pollution Control Board. Nearly 22 per cent of India’s forest land diversions (44,900 ha) between 2007 and 2012 were for coal mining. CIL, a public sector company, which mines about 80 per cent of the coal in the country, is notorious for its poor compliance. Its mining operations have devastated large swathes of land. The biggest issue involved in the use of coal as a resource is pollution. Indian coal is of poor quality: around a third of the country’s coal content is ash; it also has fewer calories hence more of it needs to be burnt to generate power. The result is more emissions and ash, necessitating better pollution control technologies. But the case is just the opposite, with lower investment in pollution control. Since transporting coal with high ash is economically inefficient, regulations cap ash content at 34 per cent for plants located beyond 1,000 km from the mine. However, four of 12 plants in the study which fell under this category–-GSECL in Wanakbori, TANGEDCO in Tuticorin, HPGCL in Hisar and MAHAGENCO in Nashik–-were using higher ash content coal. Based on our survey, we believe a lot more plants were violating this norm as they were getting poor quality coal from CIL. Reducing ash in coal is possible by “washing”. However, India’s coal washing capacity is a meagre 131 million tonnes against the current need of over 240 million tonnes. The study found coal handling, considered the most accident-prone activity in a plant, to be seriously deficient. It is routinely outsourced to unskilled contract workers with little health benefits; safety protocols are ignored in most plants. Most had poor provisions for controlling dust emissions and water pollution: almost all power plants stored coal in open yards with no wind breakers; some of the plants studied transported coal through uncovered conveyor systems. Also, very few plants had proper storm drainage system; most posed the risk of leaching into groundwater or overflowing into nearby fields and water bodies. For instance, the Guru Gobind Singh Super Thermal Power plant in Ropar, Punjab, was found storing coal rejects in a low-lying area with water logging leading to acidification. Water: In the dry, water-starved desert district of Bikaner lies Neyveli Lignite Corporation Barsingsar’s massive 12 ha reservoir, fed by water from Indira Gandhi Canal, the lifeline of Rajasthan. Thirty per cent of the reservoir’s water is lost to evaporation. This does not bother the company since it pays a paltry Rs 0.7 per cubic metre. Even for JSWEL, Toranagallu, which paid the most for water in the study (Rs 20 per cubic metre), the water cost was a mere 0.9 per cent of the tariff it received for power. As a result, wasteful consumption is common. At an average of 4 cubic metre per MWh, Indian plants with cooling towers consume twice as much water as their global counterparts (see ‘Indian plants are...’). Some plants, such as JSEB, Patratu (9.8 m3/ MWh) and DVC, Bokaro ‘B’ (8.7 m3/MWh), are profligate users as they use significant amount of water for cooling and ash handling. There are few encouraging examples such as GIPCL, Surat, and JSWEL, Toranagallu, that consume a scant 2 m3/MWh employing a host of water-efficient measures. Nine plants in the study use fresh water for once-through-cooling, a process that is no longer permitted for new plants. These plants withdraw 7 billion cubic metres annually, a phenomenal 90 per cent of the total fresh water drawn by the plants studied. All of these plants are state-owned. Exacerbating the situation is the fact that nearly half the plants studied are located in areas where severe water scarcity has been reported. Conflicts have ensued—plants such as KPCL, Raichur, and MAHAGENCO, Chandrapur, were forced to close down in the past due to water shortage. Overall, the thermal power industry’s annual water draw, estimated at 22 billion cubic metres, is equal to over half of India’s total domestic water needs. The 10small units of JSEB, Patratu in Jharkhand have a total capacity of 880 MW. All units are past their operational life and, currently, just three are functional. On most days, the units are shut because of outages. In 2012-13, the plant experienced outages for more than 80 per cent of the year, according to the CEA. The capacity utilisation, or plant load factor (PLF), was a scant nine per cent. With so many issues, the plant’s abysmal efficiency of 21 per cent is no surprise. India’s landscape is dotted with many inefficient plants; its fleet is among the least efficient in the world (see ‘India lags...’). Improving efficiency is key to meet India’s energy needs, consume fewer resources and have the least impact on the environment. The Indian power sector is handicapped. A quarter of the total capacity under the study had exceeded operational life. Second, just 1 per cent of the power sector’s capacity in 2012 comprised supercritical (SC) or ultra supercritical (USC) plants, which operate with efficiency that is 3-7 percentage points higher than that of “subcritical” technology, the most commonly used. In comparison, 25 per cent of Chinese capacity was SC/USC. Around a third of plants under the study had efficiencies of less than 32 per cent. The worst performers typically have small capacity units, poor technology and are old (see ‘Plant efficiency’). Over half the plants in the study were found to be running inefficiently due to bad operation and maintenance practices. A particularly poor performer is MPPGCL, Birsinghpur, a 13-year-old plant, whose efficiency was 22 per cent below design. On the other hand, well-maintained plants like Reliance-Dahanu had a deviation of 3.8 per cent from design (see ‘High deviation from...’). Only four plants in the study experienced less than 15 days of outages, which is considered a desirable level of availability. Poor maintenance, which results in increased outages, meant that average availability was low for the sample—11 plants experienced an average annual outage of more than 73 days during 2010-13. Even some new private plants such as Adani-Mundra and Maithon Power experienced outages as high as 95 days. Low availability combined with coal supply bottlenecks, poor off-take from discoms and poor grid integration naturally resulted in subpar capacity utilisation (low PLF), which averaged at just 72 per cent for the sample. Low PLF, in turn, leads to a drop in efficiency, creating a vicious cycle. Auxiliary Power Consumption (APC), the power consumed by the plant’s own equipment, in most cases was almost 50 per cent higher than global best practices—APC of 12 of them was over 10 per cent. Higher APC means less power supplied to the grid. As auxiliary equipment in a plant consumes a constant amount of power irrespective of load, factors which cause lower generation, such as poor efficiency and low PLF, result in high APC. JSEB, Patratu, and UPRVUNL, Obra, had the highest APC of 15.5 per cent. Most plants in India do not monitor APC for individual equipment, which makes it impossible to identify areas of excess consumption. The government launched the Perform, Achieve and Trade (PAT) programme to encourage efficiency improvement in eight industrial sectors, including thermal power generation. Even though the thermal power sector was expected to contribute 50 per cent of the total reduction under the scheme, the targets for the sector were not ambitious: overall, the PAT scheme envisaged a mere 3 per cent cut in energy consumption of the power sector, an easy goal given the Indian power sector is one of the world’s most inefficient. GRP study exposed weaknesses in the PAT scheme. Of the 31 plants that were analysed, five achieved target efficiency in 2010-11 (even before the scheme started) while four more did so in 2011-12. It appears that several plants reported low baseline efficiencies that were used to set targets, making it easy for them to vault past the hurdle. Another flaw is that the scheme does not account for upcoming renovation and modernisation (R&M) in setting targets. Plants like MAHAGENCO, Nashik, underwent R&M soon after the PAT baseline study, enabling them to make substantial gains in efficiency and meet targets. The fundamental problem is opacity of the target setting process. While guidelines for sector-wide targets are reasonable (inefficient plants need to improve more), detailed parameters employed for setting targets for individual plants are not publicly disclosed—it was, therefore, unclear if the targets were meaningful. Shortcomings like these meant that plants like UPRVUNL, Obra, whose efficiency was 27 per cent during baseline period, achieved their PAT target after R&M—but its present efficiency at 31 per cent is still quite low. Low efficiency is directly related to high CO2 emissions. The average emission rate of plants was 1.08 tonne CO2/MWh, which is seven per cent higher than the global average and 14 per cent higher than China’s. In 2012, coal-based power generation accounted for half of India’s total CO2 emissions from fuel combustions. During 2011-12, India’s total CO2 emissions grew by six per cent which was mostly on account of coal in energy production. JSEB, Patratu, was again the worst performer with an unacceptably high emission of 1.80 tonne CO2/MWh (see ‘Specific CO2...’). There were just 13 plants in the study whose average emissions were lower than the global average. No plant conformed to the global best values. Even super critical plants in the study had emissions 35 per cent higher than the global best. It is estimated that a one percentage point improvement in efficiency can reduce CO2 emissions by 2-3 per cent. Apart from improving efficiency of existing plants, adopting state-of-the-art technologies can help achieve big cuts in emission rates. On the southern fringes of Delhi, NTPC Badarpur’s chimneys reach to the skies emitting thick smoke. Yet NTPC reports compliance with particulate matter (PM) norms. The Delhi Pollution Control Committee dutifully files away the company’s environment statements that report artificially low PM numbers. This underscores the utter failure of the regulatory mechanism. The major pollutants emitted from stacks/chimneys include large quantities of ash (as particulate matter), SO2, NOx and heavy metals like mercury. National PM emission norms are lax at 150- 350 mg/Nm3, 5-12 times higher than those in China and the EU at 30 mg/Nm3. Most of the plants fail to meet even these lenient standards. The GRP study of 218 units across 47 plants showed nearly 55 per cent of the units had very high visible PM emissions: of these 85 per cent are state-owned and remaining Central (see ‘Stack PM emissions...’). Around 20 units with tighter PM emission norms of 50-75 mg/Nm3 were most likely non-compliant since their stack emissions were visible (emissions below 75 mg/Nm3 should not be visible). On paper, of course, almost all of them show compliance. Vis-à-vis SO2, there is no national norm. Although there is no regulatory requirement, most plants submit SO2 emission levels to the regulators—the data is clearly under-reported. While Indian coal has low amounts of sulphur, Indian coal-based plants use more coal per MWh of electricity generated. Therefore, pollution level of SO2 is comparable to that of imported coal-based plants. However, regulators have required only a few imported coal-based coastal plants, such as JSW, Ratnagiri, Tata, Trombay, and Adani, Mundra, to install sea water-based FGD (Flue gas desulfurisation, the common SO2 control technology). There is no national norm for NOx either. Plants report impossibly low levels despite the fact that none has any NOx control system. Some state regulators have prescribed norms for SO2 and NOx, but they are unrealistic. For example, Gujarat Pollution Control Board has prescribed NOx norms of 50 mg/Nm3 whereas the global best achieved is 80 mg/Nm3 . None of the coal-based power plants in India control mercury emission (see ‘Mercury poisoning’). In fact, very few even monitor it. The US and China have already stipulated the mercury emission norms of 0.0017mg/m3 and 0.03 mg/m3. Indian regulators have failed to set standards despite having evidence of high emissions from the plants. Studies commissioned by the Central Pollution Control Board show mercury emissions from stack as well as through ash disposal. The thermal power sector contributes 87 per cent of total mercury emissions in the country. Mercury emitted by power plants enters water bodies through ash as well as through precipitation from the atmosphere and can enter the human body if contaminated fish is consumed. CSE's Pollution Monitoring Laboratory (PML) conducted a study in 2012 to investigate mercury pollution in Singrauli-Sonbhadra region where several coal-based power plants and coal mines are located. The study revealed alarming levels of mercury in drinking water, fish and human blood and tissue—evidence of mercury poisoning in local population was widespread. During 2013-14, CSE's PML collected and analysed coal and ash samples from coal mines and thermal power plants from across the country. The study found, on an average, very high (0.61 mg/kg) mercury in domestic coal. India's coal-based power plants are estimated to be emitting around 440 g/GWh of mercury into air and water. India has no regulations to control mercury. But it may now be under pressure to introduce norms as India became a signatory to the Minamata Convention, a UN agreement, in September 2014. China recently stipulated mercury emission norms of 104 g/GWh. Indian plants will need to cut mercury emission by 75 per cent to meet the Chinese standards. However, the real challenge is to effectively enforce them. CSE estimates total mercury emission may grow to nearly 700 tonnes per annum by 2021-22, if left unchecked. Ash handling: Life was normal in Derang village in Jharkhand till NTPCTalcher and Jindal India Thermal Power Ltd plants were set up nearby. Since then, ash from the plants swirls everywhere. It deposits on the food, chokes lungs and settles on the crops, complain residents. Both livestock and people get sick from drinking water polluted by ash slurry. The story is almost the same for all communities surrounding power plants. The most serious complaint has been ash pond overflow, or downright discharge by the plants into rivers, reservoirs or fields. Some communities like those around WBPDCL, Bakreswar, have gone to court; some have resorted to violence, like those near Rajiv Gandhi Thermal Power Station in Hisar. Coal-based power plants generated 173 million tonnes of ash in 2013-14—it is the second largest waste stream in the country. Its handling and disposal is a significant challenge. Only five plants—JSWEL in Toranagallu, KSK in Wardha, GIPCL in Surat, NLC in Barsingsar and CESC in Budge Budge—use the water-efficient dry ash-handling technology. Given the grave risks ash poses, Union environment ministry has set a target of 100 per cent ash utilisation from 2014 onwards. But compliance seems impossible: 36 of the 47 plants assessed were unable to meet the 2012-13 target of utilising 90 per cent of the ash generated and average utilisation was only 54 per cent. Plants generating large amounts of ash, such as NTPC in Kahalgaon, UPRVUNL in Anpara and GSECL in Wanakbori, managed to use little of it. Unused ash is being dumped in large quantities in ash ponds, which are poorly maintained. The pollution control board had cited 70 per cent of the companies in sample for violation of norms. Less than a third of the plants in the study had ash pond lining, which prevents heavy metals from leaching into the groundwater; only a fifth of them had piezometers to monitor ground water quality. MAHAGENCO, Chandrapur’s huge ash pond, spread over 6,590 ha, is poorly maintained. During the survey ash pipelines were found leaking; water cover over ash ponds was inadequate leading to fugitive emissions. People complained that the productivity of paddy and soybean in the area has decreased by 50 per cent. The river turns white due to run off from the ash ponds in summer. Their source of drinking water, Erai dam, too is polluted, they say. Ten plants in the study were using more than 100 per cent ash. The best utiliser was TANGEDCO, Mettur, which generated an average 1.5 million tonnes during 2010-13 and used around 2.5 million tonnes on average. It even dug out ash stored in ponds and sold most of it to cement companies. Three plants had the advantage of using imported/lignite coal which has low ash content. But for several others the “use” was suspect. WBPDCL-Bandel claimed the ash was being used in agriculture and waste land development but the community complained about illegal ash dumping on agricultural fields and wetlands. 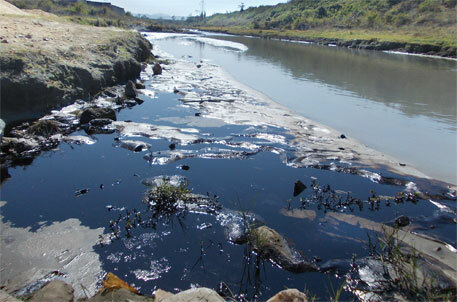 Tata, Jojobera was investigated by a state pollution committee for ash disposal in low-lying areas. DVC Bokaro-B reported sending ash for mine fillings, but it was found discharging ash slurry into the Konarriver. Ironically, there were complaints against two plants, RRUVNL, Kota, and TANGEDCO, Mettur, for hoarding ash. This suggests that ash use can increase if the industry applies itself to the task. Wastewater: Govind Ballabh Pant reservoir, the main source of water in Singrauli, is so polluted that the National Green Tribunal had ordered big companies in the region to set up reverse osmosis plants to supply drinking water. But the thermal power plants remain unfazed. NTPC Singrauli, UPVRUNL, Obra, and UPVRUNL, Anpara, directly discharge ash slurry into the reservoir. In all, 10 plants let their ash slurry into water bodies. Regulations require total suspended solids being discharged into water bodies to be less than 100 mg/litre. Samples collected during plant surveys showed 39 per cent violated this basic norm (see ‘Violating basic water norms’). Wastewater discharge is avoidable as power plants can easily reuse water from cooling tower or ash pond overflow after simple treatment since generation does not use toxic chemicals. Yet, merely 12 plants had implemented zero liquid discharge systems. The three highest rated coal-based power plants in India in the study by CSE are CESC, Budge Budge, in West Bengal; JSWEL, Toranagallu in Karnataka; and Tata, Trombay, in Maharashtra. While these plants follow certain best practices, their overall environmental performance is average when compared to the global best. Since the plants are subcritical, their efficiencies were nowhere near those of the latest ultra-supercritical plants. While their water use was relatively good, air pollution control and ash handling were a mixed bag with improvements needed. It is a 750 MW capacity (three 250 MW capacity units) power plant located in densely populated Pujali town of South 24 Paraganas district in West Bengal and has an average age of 11 years. Although it uses subcritical technology designed for 37 per cent efficiency—far below that of the global best ultra-supercritical (USC) technology—its operating performance is commendable. The plant availability averaged 93 per cent during the last three years (2010-13), indicating very good maintenance. PLF at 87 per cent was far better than the Indian average. In fact, it used to be even higher but has dropped in recent years because of low demand from the area. Second, the plant has maintained efficiency of 35.7 per cent—although the efficiency is just above the Indian average, it is only 1.4 percentage points below its design, reflecting good operating practices. The plant has shown steady efficiency improvement during the assessment period. The most remarkable feature of the plant is its efficient water use despite abundant water supply from the River Hooghly. The plant consumes only 2.2 cubic metres of water per MWh power generation—seven cycles of concentration (COC) in its cooling towers means low water use; a zero liquid discharge system (ZLD) ensures water discharged from various uses is recycled back; fly ash is handled dry; boiler water is treated in an advanced system to allow reuse and reduce losses. Its 100 per cent fly ash utilisation record is also positive, especially since 76 per cent of total ash is used for cement and bricks. 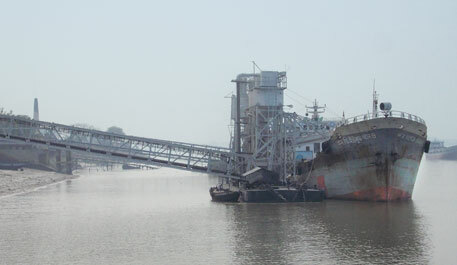 The plant sells its fly ash to cement manufacturers in Bangladesh. The plant has adopted many good practices for handling ash, including pneumatic storage in silos, pneumatic transport into barges and high concentration slurry disposal. However, its high concentration ash disposal in an “emergency” pond was found problematic with high fugitive emission. It is the only plant in India to have installed a de-watering system for disposal of bottom ash, which is largely used for filling of low-lying areas. The company was in compliance with water pollution and waste management. Unlike most of the plants in the sector, the plant meets strict PM norms of 50-75mg/Nm3 except in some incidences where high stack PM emissions were recorded by the state pollution control board. An 860 MW capacity plant (two 130 MW and two 300 MW units) is located on the premises of JSW Steel at Toranagallu in Karnataka. With an average age of 8.5 years, the plant is constructed compactly at 0.16 ha/MW and is primarily imported coal-fired. It also uses COREX gas, a waste gas supplied by JSW Steel. In 2010-13, COREX gas met 10-16 per cent of its energy need. The plant achieved a remarkable 94 per cent average PLF during the period, among the highest in India; operating availability was a respectable 91 per cent. It is one of the most efficient plants in the study with an average efficiency of 38 per cent during 2010-13. This is 1.7 percentage points lower than the design, underscoring good operations. At 0.93 tonne CO2/MWh, JSWEL’s CO2 emissions were one of the lowest in the study. The plantis one of the most water efficient in India, driven by its location in a water-parched district. It has a zero liquid discharge system with low 2 m3/MWh water consumption. COC of six cuts water use in cooling tower. It benefits from the use of low-ash imported coal, that generates merely 70 kg of ash per MWh compared to over 200 kg produced by plants using domestic coal. Though it uses dry fly ash handling system, the plant has not been able to utilise all fly ash generated; only 79 per cent was used, largely for cement making. They have failed to utilise bottom ash and use a small lined ash pond to dispose it. JSWEL was in compliance with pollution norms. However, coal handling system and housekeeping can be improved. It is among a few plants that have a full-fledged environment department and did not record any fatal accidents during 2009-13. 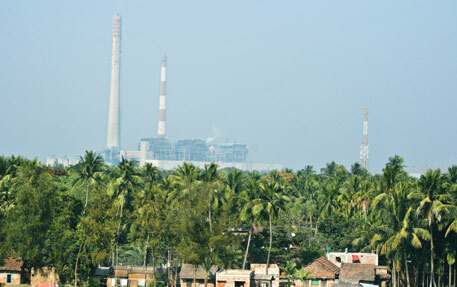 The plant located in southern Mumbai’s Chembur houses five operating units with a cumulative capacity of 1,580 MW. CSE rated only two of its units, which are coal fired, totalling 750 MW capacity (one 500 MW and another 250 MW) and have an average age of 17.5 years. The plant’s operating availability is among the best in the sector at above 94 per cent. However, at 68 per cent its PLF barely meets the Indian average—it has suffered from fluctuations in daily demand from the city. The plant design is based on imported coal. While at 34 per cent, the plant’s efficiency was slightly better than the study average, it is only 2.6 percentage points lower than design. Moreover, it has demonstrated a steady increase in efficiency averaging at 1.6 per cent per annum. Being a coastal plant, its fresh water requirement is very small—0.5m3/MWh—for boiler and domestic use. It uses seawater for cooling and ash handling (bottom ash is disposed of in wet form into a small lined ash pond). Fly ash utilisation in the plant is 100 per cent, partly helped by the fact that ash generation from imported coal is low. The fly ash is largely utilised to produce ready-mix concrete and bricks. It is one of the few plants that have installed FGD systems to control SO2 emissions. It has an independent department to manage its environmental performance. There were allegations of depletion of fish stocks due to discharge of hot water into the sea. The management has, however, given motorised boats to fisherfolk to go further into the sea. Use of coal in India is set to increase. How can India mitigate its impact? As per official estimates India would require quadrupling the country’s power generation by 2031, adding a minimum of 600 GW of mainly coal-based generation capacity to meet its energy demand. This will have vast implications for the environment and resource availability. Additionally, Indian coal’s quality has been steadily declining over the past few decades. This would further aggravate environmental impacts. Fly ash generation will be one of the most direct consequences of increasing use of low-quality coal. Currently, about a billion tonnes of ash generated during 1996-2013 lies unused in India. Along with coal-fired capacity, ash generation will more than double by 2021, increasing from 163 million tonnes in 2012-13 to 300 million tonnes in 2021 (see ‘Fly ash projection’). Where will this ash go? Fresh water is another key resource that would be impacted. In 2011-12, the sector withdrew 22.3 billion cubic metres (BCM) of fresh water, which is equal to over half of India’s total domestic water requirement. The upcoming capacity of 126 GW of coal power plants is projected to be based on the more water-efficient cooling systems, while the old inefficient plants will slowly be retired, resulting in a small increase in water withdrawal to 24 BCM by 2021-22 with a sharp increase in generation. However, water use is expected to increase by nearly 83 per cent from 2.9 BCM to 5.3 BCM in 2021-22. With India already classified as water-stressed such large withdrawal and consumption will exert an enormous strain on its water sources (see ‘Water use projections’). Air pollution load too will increase three-fold by 2021-22 if India does not put in place tighter regulatory standards for emissions (see ‘Pollution to grow enormously’). Environmental impacts of the upcoming coal-fired thermal power projects are likely to get concentrated in a few regions. This is because most of the plants approved by the Union environment ministry are concentrated in eastern and central India, close to coalfields. Since 2007 until September 2014, the ministry approved projects of total 232 GW, a capacity significantly higher than the current. Chhattisgarh, Odisha, Jharkhand, West Bengal and Madhya Pradesh together will account for 38 per cent of the total capacity to be added. About one-fifth of the upcoming capacity will be installed in coastal areas. In absence of overall assessment of needs and cumulative impacts, the proposed capacity additions will stress resources and aggravate pollution in these areas, many of them are already identified as critically polluted. However, not all is lost. The coal power sector has immense scope for improvement. The following steps can cushion the impacts of coal plants. Air pollution norms: India needs tighter norms. For instance, the norms of particulate matter for even new plants at 50 mg/Nm3 compare unfavourably to Chinese norm of 30 mg/Nm3; norms for older plants should not exceed 100 mg/Nm3. National standards for NOx and SOx need to be established with short breathing room. Monitoring needs to be improved; regulators should be given the power to impose stiff penalties to ensure enforcement. Ash policy: The use of water for ash handling and transport needs to be limited. Ash pond areas, which on an average occupy over 40 per cent of the total plant area, also need to be limited. Ash utilisation should be supported by a policy framework that encourages its use in road construction, brick making and construction. Ash use norms should consider plant location norms and available avenues. For example, a remote pit-head plant may not have cement plants near it and may be able to use only a limited amount. Closure of old/inefficient plants: China undertook a programme to substitute smaller units with larger and more efficient ones, with policy support that included financial incentives—114 GW of older capacity was shuttered in a decade. India’s Planning Commission suggested that plants older than 30 years and deviating more than 20 per cent from design should be retired, but implementation remains spotty. The power ministry had stated that it is set to retire 4 GW of capacity in the 12th plan period: far more projects need to be shuttered. Accelerating introduction of supercritical/ultra supercritical (SC/USC) plants: The National Electricity Plan (2012) has advised the Union environment ministry to refuse clearances to projects based on subcritical technology after 2012 and no coal linkages to subcritical plants 2017 onwards. Despite this, the 12th Five-Year Plan envisages that about 50 per cent of total capacity to be added in the period would be based on SC technology. The ministries need to put forward an action plan to ensure that upcoming plants utilise only SC/USC technology. Better water management: Regulatory guidelines should discourage excessive use of water. Best practices should guide approval of water needs. Importantly, tariffs paid for water by the power plants need to be increased. Regulations should make metering of water use mandatory for every significant consumption area in a plant, for example, cooling towers. This will make it easier to monitor areas of excess consumption and take reduction measures. Efficiency incentives: In the present tariff structure, plants are encouraged to merely meet average benchmarks of efficiency, instead of individual benchmarks. Tariff structure should incorporate efficiency improvements that are based on actual performance. Integrated energy policy: India’s increasing power requirements are often cited as the core rationale for accelerating its thermal power capacity. However, it appears additional coal-based capacity is not needed in the near term. While India’s total generation capacity stood at 238 GW in early 2014, the availability was only 130 GW in 2013-14—the country faced a peak deficit of 4.5 per cent. These deficits, as well as increased demand in the near few years, can be met if the PLF of coal-based plants can be improved from the low levels of 65 per cent in 2013-14. India needs to ensure that coal-based power plants are base load ones, i.e. they are run at high PLFs, an efficient way to run them. When demand peaks during the day, which is typically the case in India, solar can meet the requirements. An integrated energy policy with renewables in the mix can meet several objectives including improving energy access and reducing coal-based capacity needs. The next few years will also see increasing pressure by the international community to reduce its carbon intensity with India being the 3rd largest emitter of GHGs after China and the US. Increased investments in renewables will help in this too. Alignment of regulators: Environment regulators consider efficiency to be the domain of the tariff regulator, while power regulators consider environmental issues not to be their concern. A coordinated approach between the environment and tariff regulators would ensure that pollution standards are realistic, economical and appropriate. Power regulators are likely to set tariffs that do not take into account environment costs. This means a generator that invests in pollution control and whose costs may go up is disadvantaged. One solution is to account for the costs in establishing “merit order dispatch” to ensure that modern, less polluting plants get priority over polluting ones in supplying power even if their cost is higher. Another solution is to incorporate incentives into the tariff to encourage better environment performance. For example. China has experimented with a tariff structure where a significant portion is dependent on emission levels. Pollution and power regulators use continuous online monitoring systems to ensure compliance. Environment clearances: Environmental clearances should require best available technologies. Also, a comprehensive assessment of pollution abatement cost of coal-based power should be done. This cost should be added into the project cost so that the viability of various alternatives can be compared. This can help meet multiple objectives: regulators can require additional pollution control equipment to counter environment impact; tariff can be set to account for environmental costs. China OFFERS troubling insights into the impacts and costs of large-scale growth of coal-fired plants. Given that China's coal-based electricity generation is almost five times that of India, air pollution is one of the most visible costs that has had severe effect on health. Recent studies on China's air pollution found that over 64 per cent of the total load of pollutants and over 60 per cent of the PM 2.5 were the result of coal combustion in factories and power plants. “I am delighted that the Centre for Science and Environment has recognised JSW Energy’s Vijayanagar and Ratnagiri plants for best practices in environment management. At JSW, conserving the environment and limiting the impact of our industrial processes on the surroundings, command the same importance as P&L targets. It, therefore feels good when our efforts are recognized. Rating the Reliance Dhanu Plant in the top five for green rating is something which is astonishing. First: Its the same plant which has diverted the fresh water from Surya Canal to meet its guzzling water demand, the canal which was meant to cater the irrigation needs of the 60% tribals. Second: The story does not end here, its the same plant which has flouted the Supreme Court judgments and is yet to shift to FGD and Gas. Third: Its has already covered more then 300 Hectares of land and creeks to dump its fly ash and proposed for more then 300 hectares of land from the state government, are they going to make port of their own or wot ?. Fourth: The creeks which were breeding grounds of certain fish species and dumping of fly ash had a considerable loss to the livelihood of fishermen and same is the case for the horticulture production loss of more then 75%. Within plant boundaries they may have achieved significant resource efficiency but beyond its boundaries they have considerable ecological footprint damage beyond rating parameters. Kudos to CSE for conducting this comprehensive study! Thanks to the authors for sharing the findings through this very well-written Report. Coal quality can definitely be improved by selective mining and better beneficiation before charging to plant. Moreover upgradation to supercritical technology will also reduce pollution. All said and done, the most important aspect of its generation of Green House Gas (GHG) causing global warming should be discussed with data collected from different power plants.It is high time that Power Companies should be asked to start sequestration of mainly CO2 gasses collecting from the point source of the power plant. The cost of generation of thermal power should incorporate environmental damage cost. I am sure that most environmental friendly solar power will be cheaper in the long run.